I was going to wait to test the Kobalt 120v DC motor until I found a 80 volt battery. 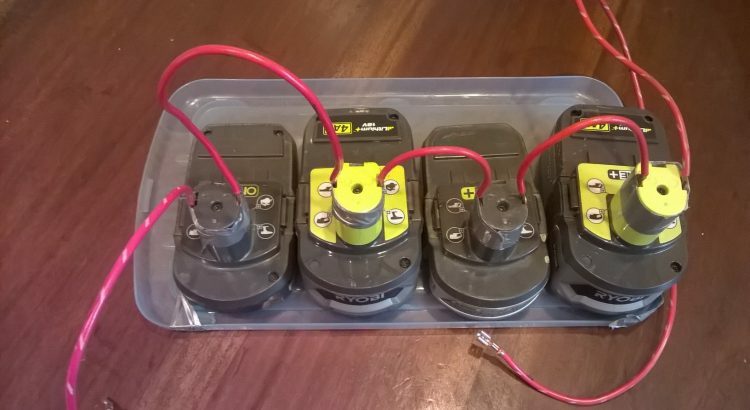 Then I realized I could connect 4 18v Ryobi batteries in series to get the 80 volts. The first test with 40 volts did not produce enough power. This test with 80 volts produced more power, but not enough to properly cut grass. I am going to remove the 120v motor and replace it with one in the 36 to 60 volt range. The EGO mower runs off of 56 volts and apparently does a good job. I will keep my eyes open for one. I will test the electrical generating properties of the DC motor after removal.